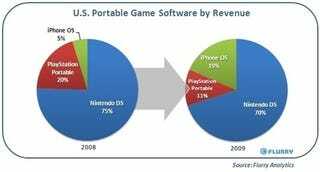 If iPhone and iPod Touch gaming is in the same category as the Nintendo DS and PlayStation Portable, then the Apple device surged in 2009 at the expense of the two dominant mobile platforms, especially the PSP. That is the finding the analytics site Flurry, which found Apple's control of the DS-PSP-iPhone portable gaming marking, in the U.S., increased to 19 percent in 2009 from 5 percent in 2008, while the market shares of both the DS and the PSP shrank. This market on the whole did grow, Flurry said, to $2.55 billion from $2.25 billion, so Nintendo's DS software revenues would have gone up by about $100 million (from $1.68 billion to $1.78 billion). But for the PSP, revenues fell sharply, falling from $450 million in 2008 to $280 million in 2009. Flurry says it took the numbers from the NPD Group and its own estimates of iPhone/iPod Touch revenues. Overall, Apple's mobile devices are figured to account for 5 percent of all U.S. video game software revenue. "Controlling 5 percent revenue of a $10 billion industry in just a year and a half is significant," Flurry wrote. "From a market share perspective, console games lost ground to portable platforms and iPhone. While the downturn in the economy may have dampened sales of the more expensive console games category, there is no denying that iPhone has generated substantial revenue and entered strongly into a mature industry." Naturally, differences in distribution, development cost, length of game experience and device features invite argument as to whether Apple handhelds should be compared with Nintendo's and Sony's. But yes, if game software on a handheld is the definition of this market, then Apple certainly is a force in it.